Richard and Alison grow walnuts and chestnuts, but at first it was not for the nuts and their use in food, but for the beautiful trees. Twenty years ago, when they bought the property, these two rural scientists hoped that in planting more trees on it they could raise public awareness for biodiversity, educating the public in forest ecology. 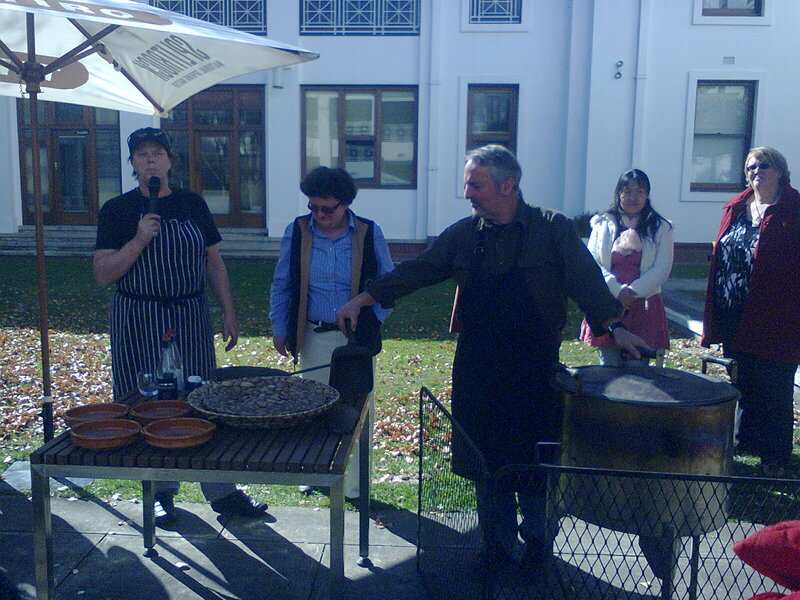 “Now, roasted chestnuts are also a delicacy that we enjoy with a glass of red wine.” Richard laughs, inviting me to such an experience on their property set in the small New South Wales village called Sassafras, 45 km south-west of Nowra and about 130 km from Canberra on the Nowra-Braidwood Road. 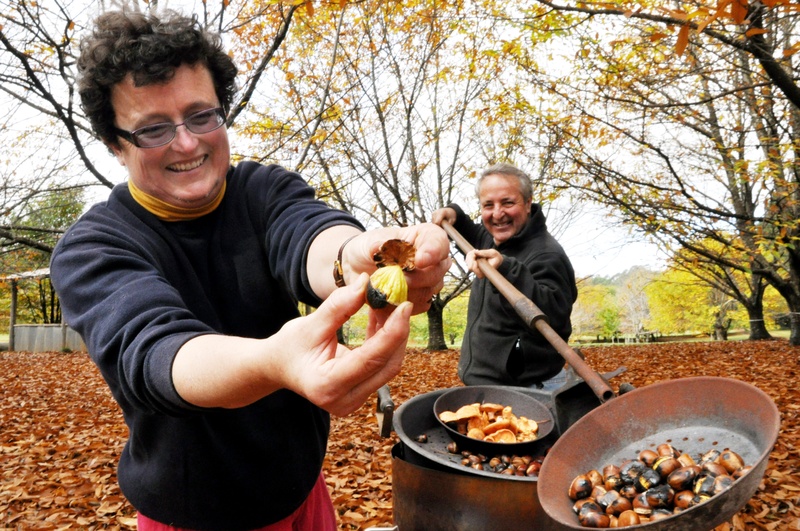 Australia’s experience with chestnuts is linked with the gold rush. At that time Europeans and in particular Chinese brought trees from overseas. They need a wet and cool climate to thrive. The ideal region should be located between 650 and 850 metres above sea level. As a matter of fact, those conditions are all found in North East of Victoria, where almost all orchards have been developed. Each year, about 3000 tons of chestnuts are produced in that area. 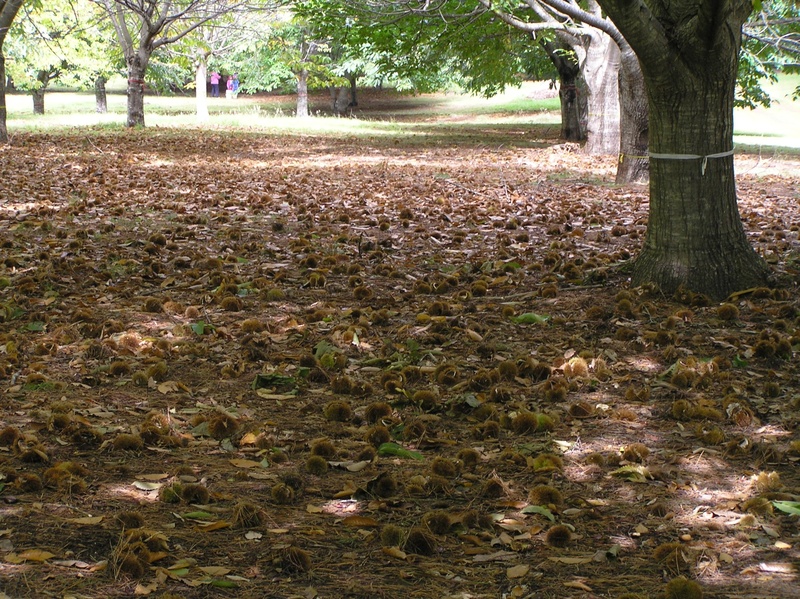 The chestnut crop, like the grape harvest, has not been not abundant this 2012 season. Richard Moxham explains: “We made 5 tons, half as much as usual. Unfortunately, the rain has affected the pollination.” However, the quality met our expectations, particularly for the late varieties. “We sell our nuts at the Sydney central market. People from Italy, Greece, Spain, Croatia and Macedonia are fond of those nuts as it reminds them of their European background”, says Richard Moxham. At harvest time, which is in April in Australia, families come equipped with buckets to pick up nuts and enjoy a day out in the country under the canopy. Some customers buy the flour, especially to prepare Italian specialities, but mainly it is just a winter indulgence, eaten simply roasted. “Well, it also unleashes a fantastic sweetness in soups and casseroles. Like potatoes it is full of carbohydrates”, Richard tells us. A soft taste to savour as a reward for enduring the scratches caused by the spiky shell when picking them up. I have been working in a daily Newspaper in the French-speaking part of Switzerland, amidst vineyards, close to the Olympic Games headquarters in Lausanne, and amongst world class gourmet restaurants in a land with breathtaking views of the Alps. But now I am here in Australia for good. This entry was posted in Canberra, Food and education, New South Wales, Salt and pepper, Sweet tooth, Victoria and tagged Alison Saunders, chestnut, forest ecology, greek tradition, Janet Jeffs, kitchen Cabinet, Richard Moxham, scientists, trees, walnut. Bookmark the permalink.